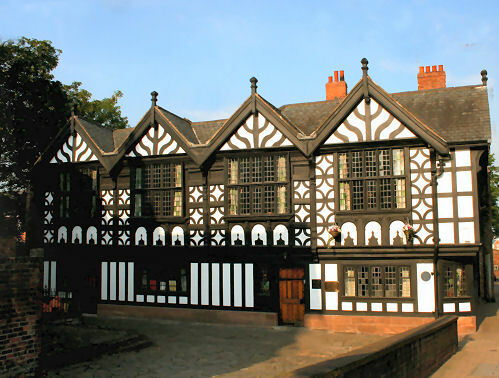 Stanley Palace at 83 Watergate Street is a Grade II listed building dating back to the sixteenth century. Once known as Derby House, it stands on, or near, the site previously occupied by the medieval Dominican Friary (The 'Black Friars'). Built as a town house for Sir Peter Warburton in 1591, it has at various times served as been apartments, a boys' school, and a museum, the building now functions as an office and meeting rooms. On the death of Sir Peter Warburton in 1621 the house was inherited by his daughter, Elizabeth, who married Sir Thomas Stanley which is how the house acquired its present name. During the Civil War, James the 7th Earl of Derby, supported the Royalist cause, and accordingly, in its aftermath found himself under arrest at the house, and later transported to Bolton for execution. By 1831 the house had deteriorated to a poor condition. Edward Henry Stanley, 15th Earl of Derby purchased the house in 1889 and the building became known as Derby House. In 1911 the house opened as a Museum & curio shop, and in the course of restoration work tunnels to both Watergate and Chester Castle were discovered. In 1928 the 17th Earl of Derby passed the house over on lease to Chester City Council, when work to restore and extend the building commenced.